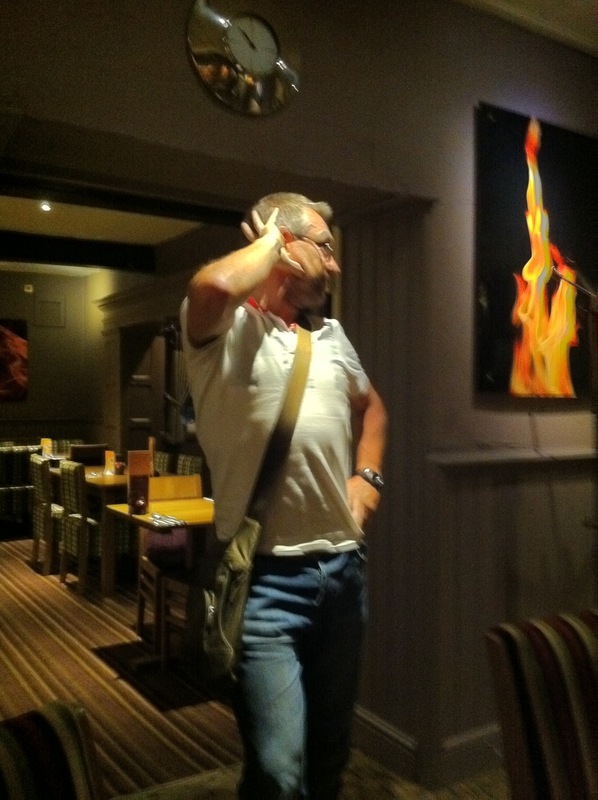 Dinner at Redhill Premier Inn turned into an awards night for three men on a bike. Categories such as best road, best hill, worst hotel, most expensive bike, hardest looking rider, smelliest helmet and best road kill were some of the many that were debated and awarded. Simon (G) modelled Peter’s man bag with and without shirt, we’re still not sure which he carried off best. It was one of the funniest nights I’ve ever had and topped an extraordinary week of endurance, challenge and friendship. Perhaps to bed a little late, it was a quiet start the next morning; well, until the Boyz from PMT reappeared. Invigorated by their 70 mile ride on the south coast a couple of days ago, they decided to come back to finish it off. With Whitesnake blaring from the shopping basket on the tandem we set off into town. Our first stop was at the Oasis Academy in Croydon where we were to present a cheque to the students for £5k to buy musical instruments. The students were lining the drive and cheered us all of the way into a packed hall. We literally rode to the front through hundreds of screaming students while DJ Dean pumped The Bike Song through the PA. The atmosphere was electric and surreal after the solitude of the road. After speeches from the head boy and Paul McManus for Music for All, the cheque was presented. The crowd went wild and the Headmaster then gave a moving speech about selfless behaviour. Simon (G) said that it was the first time he’d been called selfless. Joking apart it really brought home the reality of what we’d done and sacrificed to raise money to help others. Rose had a tear in her eye…..
David Barnard introduced the Roland Band and so began the Roland Education road show with Craig, Alex and Luke. The three men team still had more miles to do so we left them to it and pedalled on into town. Optomisticweather.com had come up trumps again and the sun shone as we weaved our way through the London traffic. Some 15 miles later after a brief stop at McDonalds (for coffee!) and an interesting spell in the Rotherhithe Tunnel we arrived in Stratford and the Olympic site. 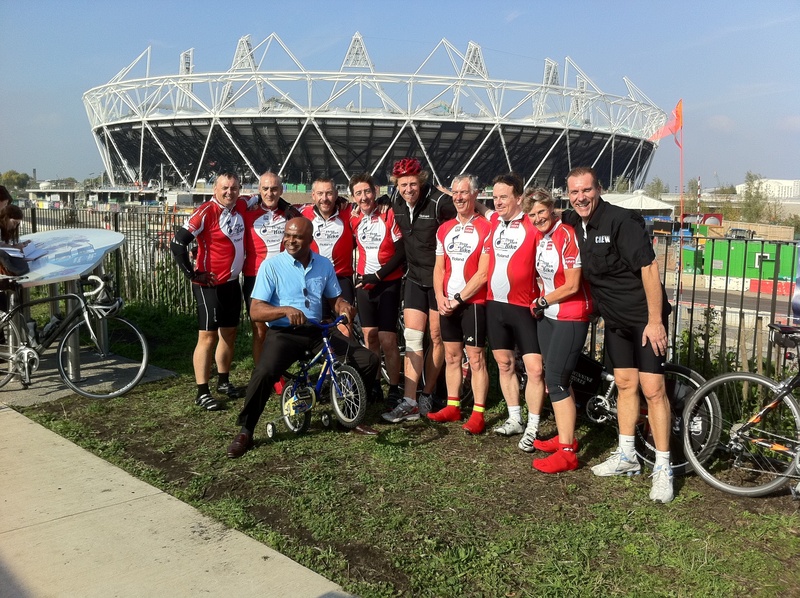 Kriss Akabusi was there to meet us and we became an instant tourist attraction. After photos galore and hugs and congratulations all round, so ended our Lands End to London marathon. Feelings were mixed, absolute elation at the achievement but almost instant sadness that it was now all over. It really has been one of the most extraordinary weeks of our lives and we all have incredibly fond memories that we will never forget. To Yellow Jersey James and Sergeant Major Lewis, you kept us safe and on track throughout. To our adopted cycling parents Terry and Rose, thank you so much for your care and support, we could not have done this without you. Alyn our support vehicle driver, chief photographer, friend of Ollie and thoroughly good bloke was a welcome sight at the end of any ride. To my colleagues Peter and Simon, it has been a privilege to ride with you. You couldn’t ask for two better guys to have on a team. Behind the three men on a bike scenes there have been so many people that have helped and supported us, it would be impossible to mention them all. Helen and her marketing team and Janine, Helena, Dean and Simon Kenning have been absolute rocks and brilliant at organising everything and letting us concentrate on the cycling. We also cannot forget all of our collective friends and family who have put up with us, our training, our lycra and bike jokes for the last six months. I hope everyone feels it was all worth it. Seeing those kids today and realising that what we have done can change people’s lives is humbling. The support from across the industry has also enabled us to really put the Music for All Charity on the map. For me it has proved that with real determination anything is possible. I am incredibly proud of the team and what we have achieved. An unforgettable journey over many months and miles. Lands End to London, we bloody well done it!! Print article This entry was posted by Editor on October 8, 2010 at 4:05 pm, and is filed under 2010 Ride. Follow any responses to this post through RSS 2.0. You can leave a response or trackback from your own site.